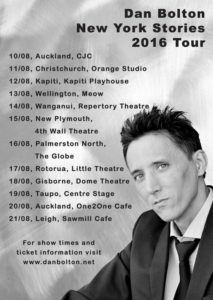 Dan Bolton returns to Kapiti Playhouse - Kapiti Playhouse Inc.
Where the new meets the old, New York City based musician and former Kapiti Coast resident, Dan Bolton is a singer/songwriter/pianist with a unique sound. His songs are 21st Century standards, incorporating elements of jazz, pop and Latin American styles. His music is reminiscent of George Gershwin, Cole Porter and Irving Berlin but with a modern twist. Dan has recently recorded 3 albums, The New York Sessions, Volumes 1,2 and 3 which he will be featuring in the show. As part of his New Zealand tour, and back by popular demand, Dan will be performing at the Kapiti Playhouse on Friday night, August 12th with New York based drummer, Mark Lockett, Kiwi jazz legend Roger Manins on sax and bassist, Johnny Lawrence (Electric Slide Hustle). The show starts at 8pm. Tickets are $30, available from Coastlands or via the TicketDirect website. To whet your appetite, check out these two YouTube videos featuring Dan’s music.